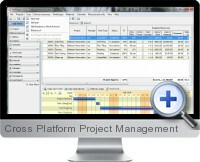 Cross Platform Project Management (AltiProject) is a project management software application available for Windows, Mac OS X and Linux operating systems that can be used to share the management of projects across operating systems. The system uses the binary Excel file format (XLS) to export and import project data for team collaboration and automated update of project status. Projects created with this cross platform project management solution can be saved and reopened across operating systems. Furthermore, the Excel files used for participant communication and collaboration can be accessed and saved across platforms and device applications that support the XLS format such as OpenOffice Calc, Microsoft Excel, iWork Numbers, etc. Project Schedule and Budget - the project is rescheduled and the budget is modified automatically as tasks are entered and updated. Resources Management - accurately represent the project structure by defining materials, work types and human resources along with cost and measurement unit information. Team Work and Collaboration - Send automatically created Excel files by email to each participant or save them in a shared folder on a network. Updated Excel file data can then be imported back into the project. Reports and Metrics - cost structure drill-down analysis, budgeted vs. reported spending and resource usage, cost performance and schedule performance indexes. Data is presented in both tabular and chart for.m and can be exported to Excel. Windows, Mac and Linux - project management can be shared across platforms. AltiProject is currently in Beta and can be freely downloaded.